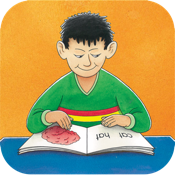 This exciting children’s story explains how the brain learns to read and the circuits that are involved for reading. Bright and fun illustrations, along with clear narrations, make this story accessible for all learning styles and ages. The first part explains in a ‘child friendly way’ how the brain is wired for reading. The second part describes how the brain develops from birth and how things can be very different for some readers, such as those with developmental dyslexia. A must have app for all reading teachers and parents for explaining to children how the brains read.